Stronger is an apt description of how trainer Peter Snowden believes the million dollar yearling of the same name will present at Rosehill on Saturday. The colt, a $1.05m Easter purchase, takes the benefit of a debut win into the Elderton Homes Made You Look Sprint (1100m) and it’s done him a world of good according to Snowden. He posted a 1-1/4 length win in a 900m two-year-old maiden at Kembla Grange on November 17 in what was effectively a second trial. “He’d only had one trial going into it and I was looking at it as an educational run,’’ Snowden said. “He learned a lot from the experience and he’s gone up a notch since that run. Last time that 900m maiden Stronger won at Kembla Grange was staged (2016) it was taken out by Serena Bay who won the Golden Gift at her next start. The two-year-old standard was set last weekend when Godolphin colt Tassort stormed to a five length win in the Golden Gift and was installed Golden Slipper favourite. Snowden trains two of the three youngsters next in line in Slipper betting, Catch Me and Anaheed, both of whom are back in work and likely Blue Diamond bound, and he concedes Tassort has set the bar. “It’s a pretty high bar too, I thought it was my fillies up until then and he’s definitely the benchmark so far,’’ he said. Snowden said he’s likely to split Stronger and stablemate Strasbourg with the latter to run in Sunday’s $75,000 Max Lees Classic (900m) at Newcastle. Stronger was a $7.50 chance with TAB while Strasbourg, the likely favourite at Newcastle, sat at $5.50 on Friday behind Nuclear Summit ($3.90) who runs at Rosehill in preference to the Max Lees. Strasbourg, a $750,000 yearling, finished a length behind Tassort in their Canterbury trial on November 13. “He’s a smart horse, if he’d drawn better I would have run him (at Rosehill),’’ Snowden said. 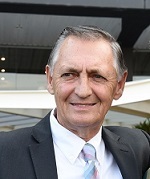 Trainer Peter Snowden (Pic: Steve Hart). Among the stable’s other runners at Rosehill, Snowden said Spending To Win’s last start failure in Melbourne should be overlooked when assessing the Listed $160,000 Starlight Stakes (1100m) where he’s $10 with TAB. Three of the grey’s four wins have come over the 1100m including a victory over subsequent Group winner Eduardo first-up at Caulfield, with Starlight favourite Marsupial unplaced. He pulled up with excuses after his shock 11th in the Doveton Stakes at Sandown off almost a two month break. “It was only mucous in the throat but he over raced badly,’’ Snowden said. “He raced too fresh, he should have eased and let the outside horses cross him and he would’ve been fine.